James Croston describes the building of the first Exchange at Market-place in 1729 and its demolition in 1792. A replacement structure designed by Thomas Harrison of Chester opened for public use in January 1809. Enlargements were made in 1838 and 1847, "and in 1853 the proprietors determined to complete the uniformity of the exterior by reconstructing the semicircular end fronting to Market-street...In 1866 an Act of Parliament was obtained to enable the company to erect a new Exchange partly on the site of the then existing one, with power for the compulsory purchase of additional lands and buildings, and to absorb the various streets and alleys necessary for the erection of the enlarged edifice. The building is of Italian character, from the designs of Messrs. Mills (the architect of the enlargement of 1859) & Murgatroyd. 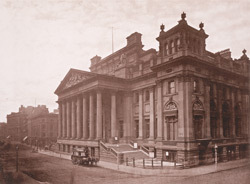 The Cross-street front, which constitutes the main entrance, comprises a spacious portico with a double range of columns, each 35 feet in height, surmounted by an entablature and pediment, and flanked on each side by pavilion-like erections, in which are placed the staircases leading to the offices on the upper floor. The north-west angle...is crowned by a circular tower 180 feet in height, in which is placed a clock and chimes."